On a day that’s packed full of history and tradition, what are some of your favorites? When you invite all your friends and relatives to your spot among the SF apartments, or make the journey to one of their abodes, what are some of the yearly rituals you observe? Some have long lists of annual traditions they practice on Thanksgiving, but there’s also a fair number who don’t do much of anything at all. If you find yourself in the latter category, or you’re just on the lookout for a few new bits of fun to add to your routine, keep reading. Today, we’re going to highlight a few fun Thanksgiving traditions you can’t help but want to give a try. For some households, decorating is the sole responsibility of mom or dad, but that routine can get worn out quick, and neglects the gargantuan amounts of fun you can have when you decorate as an entire family. As a unit, you can plan your designs, gather up the materials you need, get to crafting, and then start putting up decorations around your happy home. It’ll be the perfect way to get the family closer together and help everyone exercise their creativity during the holiday season. Fall is a great time for outdoor photographs. The beauty of those autumn leaves, that perfect sweater or jacket temperature — you’ve got everything you need to get dressed to the nines and stand around at your favorite local park or woodland and snap some family photos. You could hire a professional, or get your most artistically-capable family friend to snap the shots. Either way, repeat this one year after year and you’ll have a nice photographic record of how the family grows and changes. If you’re thinking about going all out for Thanksgiving this year, make sure to cook a big meal with a lot of options. To put that extra cherry on top, why not design and print your own Thanksgiving menus for your guests? You can get the family in on the act and make it a group project, or just handle it yourself with input from your cohorts if you’re the most creatively talented among the family bunch. We know Thanksgiving dinner is always a big deal, but why can’t Thanksgiving breakfast get some shine as well? This can be your chance to make an all-star breakfast for core family members, complete with waffles, omelettes, stacks of bacon (or not, if you’re doing the vegan thing), and even pies and pastries. Sure you might get a little full before dinner, but you can handle that in several different ways. One is to forego dinner in favor of a big breakfast. Alternatively, you might space the two far enough apart that you can build up your appetite again, and you can ensure you need the calories later in the day by participating in a run or other type of physical activity between your breakfast and dinner (just don’t overdo it!). Charities and non-profit groups often need a hand around holidays like Thanksgiving. If you’re able, why not make it a yearly tradition to help out those in need? It could be a routine charitable donation, or lending your time to helping hand out Thanksgiving meals for the homeless, or even a full day helping organize a charity event. Whatever it is, it never hurts to support your fellow man, so consider this a very worthwhile tradition you can add to your growing list. Sure, TV time and eating is all well and good on Thanksgiving, but how about adding some competition into the mix as well? There are tons of family-oriented Thanksgiving games you can play, from physical contests like relay races, to indoor activities like Tag the Feather on the Turkey. No matter which you choose, it’ll be a surefire way to ratchet up the excitement on Thanksgiving and forge some annual rivalries that can play out for years to come. Since lots of family will be meeting for Thanksgiving (in many cases), and some of them, at least, you haven’t seen in awhile, why not make Thanksgiving the time for recounting personal tales from the year prior. Sure, you could do the same thing at New Year’s, but on Thanksgiving many people are more likely to have the whole family together, so you can give everyone a chance to speak their piece. 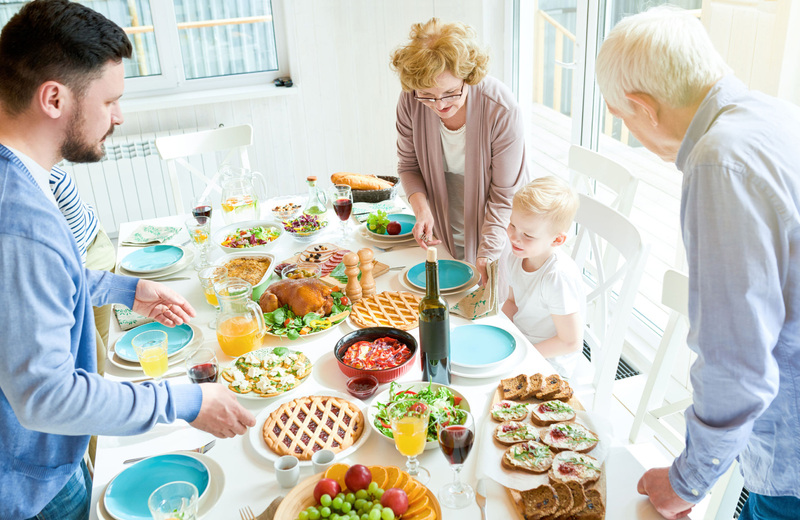 “Thanks” is right in the title of the holiday, and one thing that many families do is proclaim what it is that they are thankful for. They might go around in a circle and announce out loud what it is that they appreciate. In some other cases, they might write it all down on a piece of paper, then have one (or more) family members read off in no particular order. Whichever way you decide to do it, giving thanks is a great way to get into the spirit of the season and remind yourself exactly what you’re celebrating. If you want to get everyone in on the fun, make sure to hold a toast at some point during the day’s festivities. Everyone can get an opportunity to talk about what moves them, raise a glass to friends and family, then cheer in delight along with all the fellows. Especially when you’re in fine communities like The Towers at Rincon. Here, where the amazing backdrops of San Francisco complement the comforts and elegance of downtown, you’ll find a way of living that’s like no other. There are plenty of memories to be forged here in the heart of the city. Be sure to see what this apartment complex is all about and how you can make it your new spot within the most desirable spot the Bay Area has to offer.